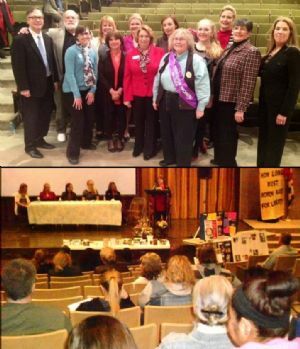 Maryland NOW and Allegany College of Maryland presented the Third Annual Women's History Celebration & Networking Event "Women Leaders - Past and Present" on March 31, 2014 in Cumberland, Maryland. Women officials and leaders from Allegany and Garrett Counties were recognized and a portion of the program for them was reserved to share a bit about their duties and career paths to the attendees who might like to choose public service as a career choice. A Proclamation from United States Senator Barbara Mikulski to the group recognizing the event as well as the importance of women's history and rights, was presented and read by Julianna Albowicz, United State Senator Barbara Mikulski's Western Maryland Field Representative. Kate Campbell Stevenson, a nationally-known performer who portrays historical women, entertained as the suffragette leader Alice Paul, and Eleanor Roosevelt. An extensive exhibit of buttons, photographs, newspapers and other items focusing upon women's history was also presented by historian Albert Feldstein. Front Row, left to right: Julie Hartman, Women's Studies Coordinator, Frostburg State University; Cherie Snyder, Director of Human Services Program, Allegany College of Maryland; Dr. Cynthia S. Bambara, President, Allegany College of Maryland; Linda Mahoney, Past President, Maryland National Organization for Women; Claire Romaine, Student Representative, Allegany County Board of Education; Julianna Albowicz, Western Maryland Field Representative, Office of U.S. Senator Barbara Mikulski; and Cherie Krug, Executive Director, Garrett College Foundation. Back Row, left to right: Robin Summerfield, Western Maryland Representative, Office of U.S. Senator Ben Cardin; Sara-Beth James, Board Member, Allegany County Board of Education; Albert Feldstein, Historian; Dawne Lindsey, Clerk of the Allegany County Circuit Court; Courtney Thomas, Executive Director, Allegany County Human Resources Development Commission; and Kate Campbell Stevenson, Historical Actor.